It was Christmas lunch at Amanda and Richards' house today, in the village of Mabe, just outside Falmouth. We would like to thank everyone who has sent their best wishes to us at this time of year and we wish you all a happy and successful 2010. They must be celebrating Christmas early in Kingston, Ontario, with the news that Queen’s University Mining Department has received a $10 million donation from mining entrepreneur Robert Buchan (left). 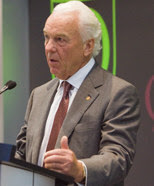 It's the largest single donation to mining education in Canadian history and will help drive the development of the global mineral resource industry. In recognition of this exceptional gift, the department will be renamed the Buchan Department of Mining. The full story is on MEI Online. Maintaining the momentum of last month’s Flotation ’09, which was attended by 193 international delegates, the next scheduled flotation conference has already attracted 3 corporate sponsors. Two of them, Maelgwyn Mineral Services and FLSmidth, sponsored Flotation ’09 and are strong MEI supporters, Maelgwyn also sponsoring Precious Metals ’10 and FLSmidth having sponsored this year’s Physical Separation ’09. Martyn Hay’s successful one man company, Eurus Mineral Consultants is a new flotation sponsor. Martyn presented an excellent paper at Flotation ’09 and also sponsored Nickel Processing ’05. The website for Flotation ’11 is up and running and we look forward to working on this major event over the next couple of years, with our two MEI flotation consultants, Profs. Dee Bradshaw of JKMRC, Australia, and J-P Franzidis of University of Cape Town, South Africa. After the predictable fiasco of Copenhagen, the question is where does this leave the minerals industry, one of the world’s greatest emitters of CO2 and under intense pressure to reduce those emissions? The failure to arrive at binding legal agreements, merely producing expressions of intent, will fuel the global warming deniers who will use Copenhagen to show how politicians are happy to embrace anthropogenic global warming (AGW) theory to collect green taxes, but when it comes to the big crunch they do basically nothing. There is a big difference between a denier and a sceptic. The former often has little scientific knowledge and may have vested interests, in the same way that the tobacco companies once denied the link between smoking and lung cancer. There is nothing wrong with being sceptical, as scientists should question the science of other scientists. Most scientists that I speak to agree that humans play a part in climate change, but are unsure of the extent of human input. The Royal Society’s committee on climate change is very much pro-AGW, but when I pushed one of their senior men some time ago as to what extent humans have contributed to temperature increases he said that he thought that AGW might have contributed about 90%. This may seem a very vague response, but it is a sensible one, as in truth nobody really knows the human contribution. The important point is that if we agree that to some extent we contribute, then the exercise reduces to simple risk management- I don’t expect my house to catch fire today, but I pay the insurance just in case- it is too risky not to do. So I ask the question again. What does the minerals industry do now- proceed with expensive schemes to reduce emissions, such as carbon capture and storage, or do as little as possible and make hay while the sun shines (ever hotter)? These are questions that I hope will be asked and hopefully answered at Climate Change ’11 in Falmouth. I have just given Elsevier the go-ahead to proceed with publication of the next special issue of Minerals Engineering- Sustainability, Resource Conservation and Recycling, which will be published in March (Volume 23 Issue 3). This will contain 15 selected papers from SRCR ’09, which was held in Cape Town in April, and has been ably guest edited by Profs. Markus Reuter (Ausmelt Ltd, Australia) and Kari Heiskanen (Helsinki University of Technology, Finland). The next conference, SRCR ’11 will be held in Falmouth in May 2011, immediately followed by Climate Change and the Minerals Industry ’11 and Risk-Based Approaches to Major Decisions ’11. It promises to be a week not to be missed! I was browsing the October issue of the Journal of Southern African IMM this morning and came across “A Letter from London” by Prof. Jan Cilliers (left) of Imperial College. Jan points out that in terms of actual operations and tonnages the UK is not much of a mining country any more (although there may be an exciting new polymetallic mine in Cornwall soon). It does, however, have an enormous influence, London being the home of head offices of a number of major mining houses, and the UK has a very strong mining and mineral processing research presence internationally. None more so than Jan’s impressive team of young researchers at Imperial College, who were out in force at last month’s Flotation ’09 conference in Cape Town, presenting 7 high-quality papers. Jan must be congratulated on bring together such enthusiastic and bright young people. Just over a year ago Rio Tinto announced a major partnership with Imperial College, creating the Rio Tinto Centre for Advanced Mineral Recovery. The Centre is a research hub in which world class scientists are developing innovative technologies to improve mineral extraction and recovery, while minimising environmental impacts. The Imperial partnership is one of three that Rio Tinto has established, and the only one outside Australia. The Rio Tinto Centre currently runs four projects, each over a 5 year lifetime. Two projects are in mineral processing: froth flotation and leaching, and two in geophysics. Complex computation is a major component of each of the four projects. Keep up the good work, Jan et al. I see Amanda is tweeting again on Twitter (am I going mad!!). November 13-14 Zinc Processing '10. There are calls for papers for these 3 events, and abstracts should be submitted by the end of June. Cornwall has an illustrious history of metal mining. In the 19th century the county was the world's biggest producer of copper and tin. The demise came with the discovery of large porphyry copper deposits in the Americas, and vast alluvial tin deposits in South East Asia. Copper mining effectively ended in the 19th century, while tin mining carried on at the deeper levels, the final mine, South Crofty closing down in the mid 1980s. Now there is hope of a revival. I was talking to one of my ex-CSM students, John Webster at the CSM Lunch on Saturday. John, who left CSM with a Higher Diploma in 1980, has been recruited by South Crofty's new owners, Western Union Mines, to bring the mine back into operation within the next two years. Originally South Crofty mined a narrow vein of cassiterite, in contact with the granite host rock, to produce tin and by-product tungsten. However various other ore-types have been discovered, containing copper, zinc, silver, lithium and indium, which could make South Crofty a true polymetallic mine, that could take advantage of fluctuations in metal prices, rather than be at the mercy of tin prices. The next phase of operations will involve de-watering and WUM is working closely with the Environment Agency to ensure that the process is carried out in line with strict environmental regulations. 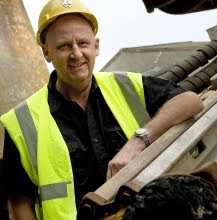 John is confident that the future is looking very bright indeed and Cornwall will very soon become a world class base metal producer once more. Barbara and I have just spent a very pleasant afternoon in the old tin mining town of Redruth, with 60 members of the CSM Association, for the annual Christmas lunch. It was good to catch up with old friends, including my old mineral processing colleague at CSM, Jim Turner (left). Jim is now in his 80s, and the photo below shows Jim with two other octogenarians, who I first met on the staff when I arrived at CSM in 1974, John Shrimpton, head of mining, and Ron Hooper, head of surveying. It's hard to believe that this time last week Barbara and I were in South Africa, Jon in Namibia and Amanda in Spain. This week has been intensive catching up- responding fully to all emails, allocating referees to Minerals Engineering journal papers and collating abstracts submitted for Comminution '10. This is looking good and is on track to being as successful as Comminution '08. We will be putting a provisional programme together later this month, so it is still not too late to submit abstracts. Amanda has also been busy and MEI Online is on the move again, with new headlines and news items. She has sent out a newsletter today, slightly later than usual. Jon is back in UK now, and is in London at the moment for his girl-friend's 30th birthday. He's back in Cornwall on Sunday, so we should be back to full normality on Monday! If you are interested in the processing of gold, silver, PGM or nickel ores and concentrates, then Falmouth, Cornwall is the place to be next June. Precious Metals '10 and Nickel Processing '10 will run back to back at the Falmouth Beach Resort Hotel. Precious Metals '10 is currently sponsored by Maelgwyn Mineral Services, Newmont Mining and Barrick Gold. Nickel Processing '10 is sponsored by Xstrata Process Support. If you would like to present a paper at either conference, then the deadline for abstracts is the end of this month. It is reported today that more than 1700 scientists have agreed to sign a statement defending the "integrity and honesty" of global warming research, responding to a round robin request from the Met Office as a sign of how worried it is that emails stolen from the University of East Anglia are casting doubts on anthropogenic global warming (see my blog of 23rd November). This to me doesn't seem the best way of convincing people that the science is sound, and one of the scientists said that he felt under pressure to sign the circular or risk losing work! The Met Office also admitted that many of the signatories did not work on climate change! One scientist told The Times "The Met Office is a major employer of scientists and has long had a policy of only appointing and working with those who subscribe to their views on man-made global warming." Do thermometer readings "cut out the doubt"? An article in today's Times reports on yesterday's Climate Change debate in Copenhagen, and is headed "Back-to-basics measure cuts out the doubt". It reports that the data from the World Meteorological Organisation is a welcome return to basics. It does not rely on any of the 'proxy' measurements that are subject to criticism, but is based on the simplest, most direct measure of temperature- land and sea-based thermometers. You said: "During the 20th century the number of stations providing data must have fluctuated, and those situated in or near cities must have been influenced by the 'urban heating effect'".This is a good point. However, the inhomogeneities in the data sets are well known and accounted for..... In addition, the UHI is well known and can be accounted for in climate records.We can measure C02 levels from proxy records too (including ice cores, plant stomata etc) and they also show a consistent rise with GHG emissions. So I am not at all sure how thermometer readings "cut out doubts". and maybe Stephan, you could clarify how "inhomogeneities in the data sets" are accounted for. You also stated in a comment on October 19th that "The input data to the models doesn't include average annual temperature. The models are developed from simple energy balance models....temperature is an output rather than input." Even more confusing! Life cycle assessments of the mining and mineral processing of iron ore, bauxite and copper concentrate have been carried out by workers at Australia's CSIRO and the results published in Journal of Cleaner Production. The work focussed on embodied energy and greenhouse gas emissions. The results showed that loading and hauling make the largest contributions to the total greenhouse gas emissions for the mining and processing of iron ore and bauxite. In the case of copper ore, the crushing and grinding steps make the largest contribution to the total greenhouse gas emissions for the production of copper concentrate. These results indicate that efforts to reduce the increased greenhouse gas emissions from mining and mineral processing, anticipated in the future as a result of falling ore grades and more finer-grained deposits, should focus on loading and hauling for iron ore and bauxite, while for copper ore the focus should be on grinding. There are a number of new and emerging technologies that could be expected to assist in this task, and these include high pressure grinding rolls and stirred mills for grinding, areas which will be explored in April's Comminution '10 conference in Cape Town. Emerging technologies to combat CO2 emissions is also one of the themes of Climate Change and the Minerals Industry '11. After over 4 weeks of fine dining in the Cape, it was back to the real world today, starting with an excellent bacon buttie and mug of tea at the West Cornwall Pasty shop on Platform 1 of London Paddington Station. We are back home in Falmouth now, and looking forward to an evening meal of beans on toast and catching up on a few missed episodes of Coronation Street! OK, sad, I know, but bliss, and this will be the first wine-free day for several weeks- also the first time we have seen TV for a while, apart from the tedious World Cup Draw from Cape Town on Friday night. Had texts from Amanda and Jon. Amanda returns tonight from a "tiring" week of conferencing in Spain, while Jon has been canoeing on the Orange River in Namibia, and crosses the border into South Africa tomorrow, returning to Famouth later in the week. Back to the grind tomorrow, and hopefully sorting out the programmes for the forthcoming conferences, Processing of Industrial Minerals, and Comminution. Very hot final day in Franschhoek. Barbara and I enjoyed yet another excellent lunch, this time at Cafe Bon Bon at La Petite Dauphine Guest Farm, before leaving for the airport. Hermanus- The Windsor Hotel (3). Adequate accommodation and very conveniently situated on the sea-front, within walking distance of the restaurants. Swellendam- The Coachman Guest House (5). Very relaxing overnight stop, with lovely gardens and pool, and good breakfast. Knysna- Milkwood Bay Guest House (2). Wonderfully situated on the lagoon, but disappointing amenities and breakfast. Main criticism is that it is GROSSLY over-priced, so we cannot recommend it. A better option is the adjacent Under Milk Wood cottages, where we have stayed twice previously, which are more basic, but are good value for money considering the location. Prince Albert- Dennehof Guest House (5). Wonderful Karoo character, and excellent breakfast. Matjiesfontein - Lord Milner Hotel (3). A must stop-over, but the faded elegance is fading very quickly. The pool was out of service, and judging by the colour of the water, has been for some time. Excellent Karoo lamb, however, at the evening dinner. Franschhoek- Erica's Guest House. Our 4th time here, and never disappoints. Paul and Rosemary very friendly and helpful hosts. Great place to relax by the lovely pool and gardens, and the main street of Franschhoek is only a short walk away. There can be very few restaurants in the world with a view like this one, at La Petite Ferme Wine Estate, Franschhoek. Today, over lunch at the restaurant, we bade farewell to our friends Judy, Mike and Jane, who fly back to the UK today. Barbara and I have one more night in Franschhoek before leaving for Cape Town airport tomorrow afternoon, and the long journey back to a very wet and cold Cornwall. Hope the blog followers have enjoyed our trip around the beautiful Western Cape. It's back to basics on Monday!! One of South Africa's most beautiful drives today, through Worcester to Franschhoek, via Du Toit's Pass. Our favourite Guest Houses on this grand tour are Prince Albert's Dennehof and Erica's, nestling under the mountains at Franschhoek. After a quick dip in the pool, we picnic-lunched under the trees at the nearby Mont Rochelle Wine Estate. Then back to Erica's to check email and the journal. Good to see that papers from Flotation '09 are now flowing in for the special issue, but apologies folks- I won't be dealing with them until next week, when we return to a very cold Cornwall. After an excellent breakfast at the Dennehof (left), and a leisurely morning in Prince Albert, we left for the Karoo and a stop-over at the quirky town of Matjiesfontein, a remnant of Victorian colonialism, and the faded elegance of the Lord Milner hotel. With well-preserved shops and post-office, this single street town resembles a film set and the railway station in front of the hotel serves the main line from Cape Town to Johannesburg. Today we travelled from Knysna to Prince Albert on one of my favourite South African drives, through the Outeniqua and Swartberg Passes. This was the 4th time that we have made this journey, the first being with the family in 1982, when I was a visiting lecturer at the University of Cape Town. 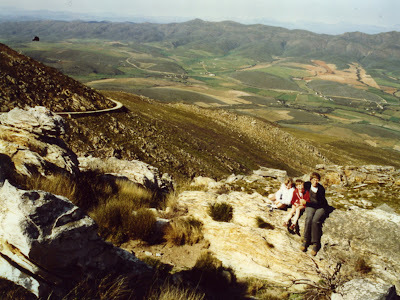 The Swartberg Pass between Oudtshoorn and Prince Albert is a unique experience and a major challenge for our friends, who are not too happy with heights. An untarred road with precipitous hairpins, it offers some of the most spectacular scenery in the Cape. Arriving in the little town of Prince Albert, on the cusp between the Little and Great Karoo we stayed overnight at the Dennehof Guest House, a National Monument homestead.